Posted byJoelRieves	 October 16, 2015 October 16, 2015 Leave a comment on The Real Christian Candidate? In country whose founding fathers swore wasn’t based on any religion, Christianity plays a humongous role in American political life. To get any traction in a political campaign, it’s pretty much a given that a candidate has to lay out their faith credentials for all to see. And, it’s also pretty much a given that those credentials had better be of the Christian variety if said candidate wants to get elected to anything, down to and including dog catcher (or whatever the lowest possible elected office is these days). There are, of course, exceptions like Keith Ellison, who’s a Muslim, or Pete Stark and Barney Frank, both atheists. Interestingly, Frank didn’t mention his non-believer status until after he retired, but had no problem coming out as gay while still in office, 25 years ago. If that doesn’t speak to America’s obsession with Christianity, I don’t know what does. This religious fetish is…, let’s say problematic, for most progressives (not to mention infuriating for atheists), but it does exist. However, since this is the way things are, why don’t we see who the real Christian candidate is in the race for president? Now, don’t get bent out of shape when I say “the real Christian candidate”; I’m not talking about who adheres to the twisted evangelical/fundamentalist version that prevails in this country today. 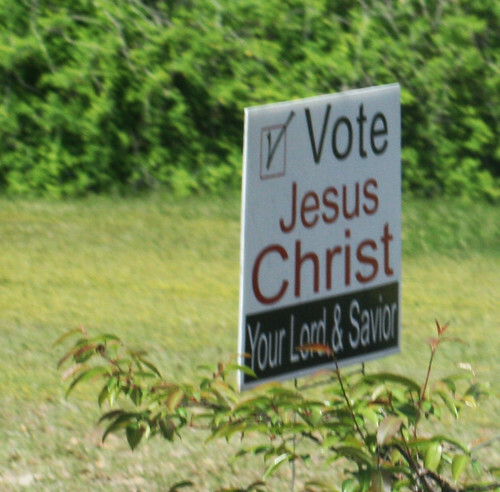 I mean which candidate’s policies most closely follow the words and teachings of Jesus. You know, the guy we Christians claim to follow? Since we have to have a way to determine this, I’ll use following scriptures: Luke 4:18-19, Matthew 5-7, Mark 10:17-27, Matthew 25:31-42 and John 13:34, as they capture what I believe is the essence of Jesus’ message. So, weighed against these passages, who is the most Christian of all the candidates running for the highest office in the land? Strangely enough, it’s a non-religious Jewish guy named Bernie Sanders. Even a cursory look at his campaign’s website shows that Sanders’ policies (especially those concerning economic and justice issues) hit more of the points addressed in these scriptures than anyone else in the race, Republican or Democrat. Oh sure, there are places where other candidates may come closer, but taken as a whole, Sanders is most Christian of all the people running for president this time out. Well, except for that whole “not being a Christian” thing. But wait, you say, Bernie’s a socialist! How can a socialist be a Christian? While we can’t say that Jesus was actually a socialist (mostly because that label didn’t exist in the 1st century), I’d have to say he was closer to that than a capitalist. And, the early church (as described in Acts 2:42-47) was the quintessential commune. And, that’s “commune” in the communist sense, not just a bunch of people living together. The truth is, the actual Kingdom of Heaven as described by Jesus sounds a lot more like a Israeli kibbutz than anything you’ll find in Atlas Shrugged (a book that holds at least as much sway in conservative circles as the Bible these days). I know that’s hard on the American ear, what with our mania for individualism, but it’s the truth. Now, some of you might accuse me of stumping for Bernie and maybe I am. But, the fact is, I won’t be voting for any candidate until the general election because I’m an independent (North Carolina doesn’t allow us indies to vote in primaries).That means I’m about as close to a disinterested party as you’re going to find these days. In the interest of full disclosure, I will admit that if i could vote, I’d probably pull the lever for Bernie (at least in part because I really don’t like Hillary). So, what was the point of all this? Basically, I find it interesting that a) the candidate whose platform most closely follows Christian tenets isn’t even a member of that religion and b) that man’s platform is considered by most Christians as “socialist”, as if that’s a bad thing. Only in America, my friends. Only in America.